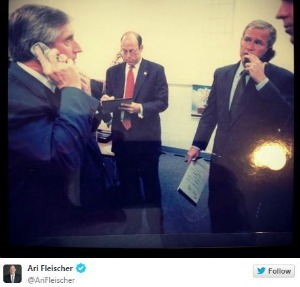 On this day of 9/11 remembrance, former George W. Bush Press Secretary Ari Fleischer took to Twitter to share his memories of that horrible day, which he spent by the President’s side. In a stream of posts that has gone on for hours, Fleischer recounts the moments immediately after the World Trade Center towers were struck and the steps the President, his administration and the military took in those confusing hours after. It’s an amazing story well told, showing what it was like before technology was stepped up to what we know now (so much has changed). And it illustrates the importance of sharing solid information quickly among those internally and with the American people. Reading it today, even after all these years, conveys all of the sadness, fright, frenzy and anger of 13 years ago. Moreover, we get a usually untold sense of what a press secretary’s role is in an emergency. We have a few tweets after the jump, but you can check it out entirely on Fleischer’s feed.